Background: Collagen is the major protein component of the vessels. Collagen type IV is found exclusively in the basal membrane and doesn’t form individual fibers, but instead is presented as a polygonal amorphous matrix that is associated with laminin and other matrix macromolecules to form the unique matrix basal membrane. Under the influence of the risk factors characterizing the metabolic syndrome, a variety of basal memrane degrading enzymes are activated. This leads to an early changes in vascular wall and accelerates the vascular aging The early manifestation of the metabolic syndrome in younger people in the modern society, leads to earlier manifestation of the complications of early vessels aging. Loss of elasticity is a key component in the pathogenesis of cardiovascular complications. Materials and methods: A study is conducted on 62 subjects with metabolic syndrome without vascular complications and 42 controls. The main objective of the study was to compare the imunological markers of Collagen typr IV degradation in both groups and to assess their relationship with the risk factors characterizing the metabolic syndrome. Results: When comparing the levels of Anti Coll IV Ab IgG in the control group and subjects with metabolic syndrome (respectively 0.28 + / - 0.08 and 0.40 + / - 0.11) a statistically significantly higher levels of Anti Coll IV Ab IgG were determined in the group with metabolic syndrome, F = 30.299, p = 0.000, In the whole sample Anti Col IV Ab IgG showed negative correlation with HDL with a correlation Spearman coefficient r = 0,26, and p = 0,02. The antibodies showed positive correlation with the diastolic pressure (DP), blood sugar (Gluc), total cholesterol (Tchol), triglycerides (Tg) and LDL. The positive corelations were with Pearson correlation coefficient as follows: DP - r = 0,22, p = 0,04; Gluc – r=0,27, p=0,01; TChol – r=0,30, p=0.005; Tg – r=0,34, p=0,002; LDL – r=0,32, p=0,002. Conclusion: It is proved that the ACol IVAb IgG and are significantly elevated in the subjects with metabolic syndrome without manifested cardiovascular complications compared with the control group and there is a strong correlation between the Ab and the risc factors . Please cite this article as: Mekenyan E, Stancheva N, Tisheva S. CHANGES IN THE IMMUNOLOGIC MARKERS OF COLLAGEN TYPE IV DEGRADATION IN SUBJECTS WITH METABOLIC SYNDROME. J of IMAB. 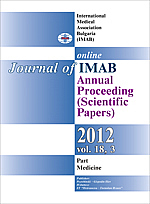 2012; 18(3):342-344. doi: 10.5272/jimab.2012183.342. 8. Nilsson PM. Early vascular aging (EVA): consequences and prevention Vasc Health Risk Manag. 2008 Jun;4(3):547–552. [PubMed].